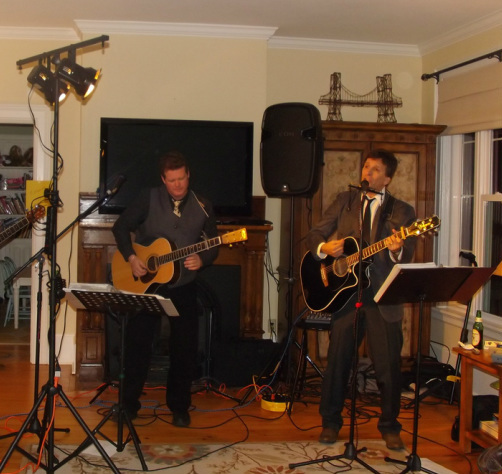 Nodzo & Van Arsdale of N&V bring a strong representation of music to their audiences with unique arrangements. Often they mix vocal harmonies with electric/acoustic guitar, harmonica, banjo, ukulele and mandolin. This group often engages the audience, getting everyone to join in and sing along. Come enjoy original compositions and favorites that span musical decades. Nodzo and Van Arsdale are among the most adaptable musicians around. Their strength is the ability to read a crowd. With a wide variety of music ranging from Blues, Jazz, Oldies, Classic Rock and modern day favorites... this duo pleases all walks of life. Perfect for pubs, taverns, country clubs or private parties N&V will do the entertaining for you. Keep your patrons in your venue and your guests happy. "N&V always provides a perfect song selection and volume level for any event." ~ Sean Lattimore, Owner of Springside Inn and Oak and Vine.